I'm not a fan of weetbix.. 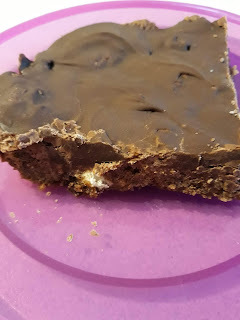 I never have been.. but we have it in the cupboard because little miss sometimes eats it for breakfast.. there were only a few weetbix left so I thought I'd make a weetbix slice and this was the recipe I used.. I didn't have enough ingredients to make the full recipe so I just cut it in half.. and I didnt have any coconut so I substituted 4 milk arrowroot biscuits that I crushed.. 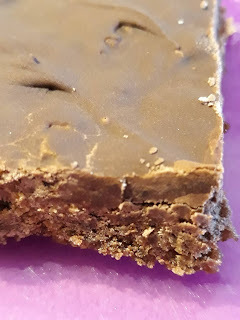 I also added some sultanas as well..